This resource is to give you some practical information to assist you in practicing EBHC. 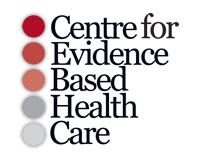 One general resource, the EBM toolkit: includes useful information and resources related to all the key steps of EBHC. It includes critical appraisal guidelines for various study designs. The UK Cochrane Centre have a project to engage students of all disciplines, in any part of the world, with evidence e-based healthcare. The main aim is to get even more students engaging with the Students 4 Best Evidence network, whether through the website (www.students4bestevidence.net), or through the Facebook page (www.facebook.com/Students4BE), or on Twitter (@Students4BE); writing blogs, review evidence-based resources and starting discussions on the site. The key first step is to phrase your question clearly. A guideline to the right phrasing of the question is to use the PICOS principle. EBM toolkit includes critical appraisal guidelines for various study designs. Were the study participants similar to the patient in your practice? Does your patient match the study inclusion criteria? If not, are there compelling reasons why the results should not apply to your patient? Do the results of this study fit with other available evidence? Are the benefits worth the costs and potential risks? Once you have decided to use the results from a study it is important to assess / evaluate your practice to see how it worked. See the EBM toolkit for more information.